Monet’s ‘Water Lilies’ were ignored for many years after the artist’s passing. 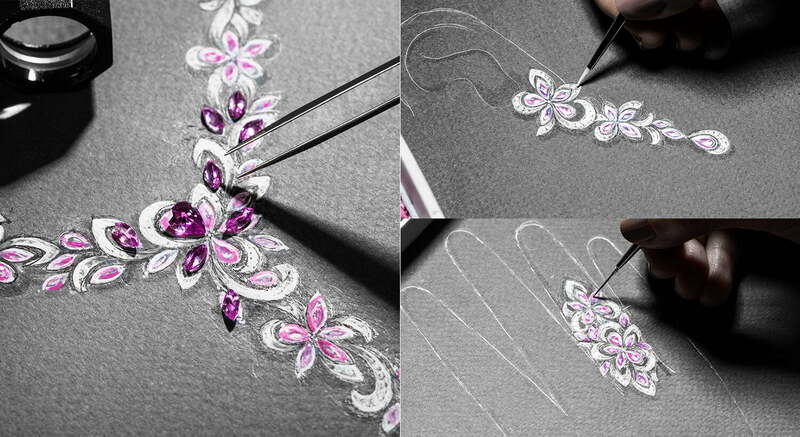 Yet, the beauty of the Ninfea Collection by Sartoro seems impossible to overlook, with its rare diamond blooms and stunning Pink Sapphire colors that tempt and capture the eye impulsively. Organic, fresh and vibrant, with fragrant pink sapphires dazzling white diamonds and 18K gold. the Ninfea Collection is a Pre-Raphaelite poetry made as jewelry. The first blush of youth and beauty is ideally captured in a selection of organically designed pieces, from floral statement necklaces and semi-detachable choker to beautiful ring and earring. Take a stroll through a walled secret garden at dusk; explore the beauty of a picturesque garden flowerbed, or marvel at Sartoro wildflowers blooming in the spring and you will capture the exquisite essence of Ninfea. Dazzle with the perfect petals of a statement necklace from the collection on the red carpet at Cannes or shine at a social occasion on a sun-drenched terrace in St Tropez this summer. The Ninfea Collection exudes poise, femininity, and beauty with all its alluring qualities, no compromises. Designed to capture hearts with colors and fine workmanship, each exclusive piece in the collection is expertly crafted, creating a truly unique set of jewelry. Every single creation in the set is exclusively made to be treasured and adored – much like the elegant woman who wears it.